Just as my friend Kelly decided to honor the fab 70's Swedish band ABBA on Friday by noting that Friday was National Take a Chance Day, which really had very little to do with ABBA's #1 disco classic "Take A Chance", but did lead in nicely into her blog post for Friday, I've decided to do something similar. Today, I'd like to honor a TV legend who passed away a year ago today: Bea Arthur, best known for her groundbreaking roles on television as Maude and Dorothy Zbornak on The Golden Girls, although her career began decades earlier on Broadway (actually, off-Broadway). Part of my reason for this is because just last week, an organization that she was an honorary director of, in this case PETA (People for the Ethical Treatment of Animals), began running some new ads featuring the late actress which called attention to one of the nation's largest buyers of chicken for it's antiquated (and cruel) slaughter practices, which aren't even within the current USDA standards. As TV Guide wrote, the campaign may be taking a page out of Nike and Tiger Woods' advertising book. The ads target McDonald's chicken-slaughtering practices, and the new ad features a shot of her — with her trademark glare — and the headline: "McCruelty: It's enough to make Bea Arthur roll over in her grave." 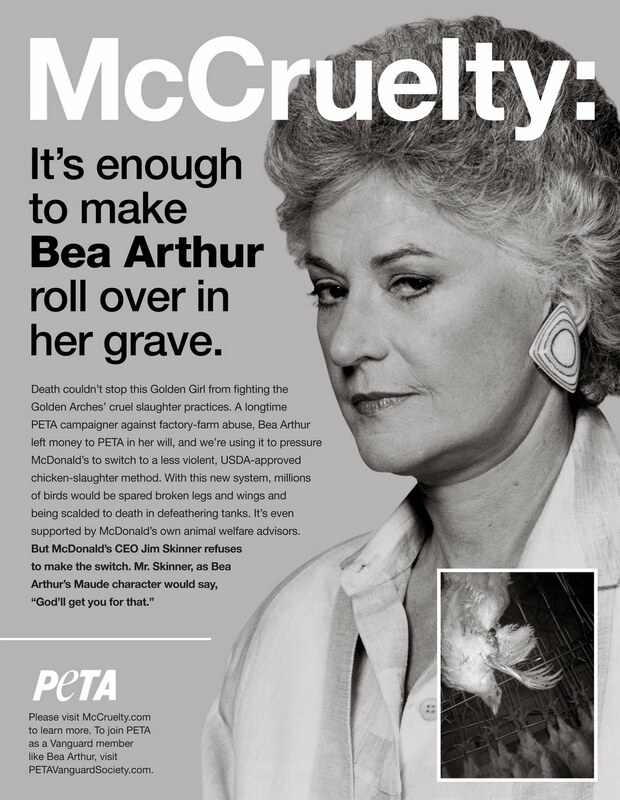 Incidentally, The New York Times reports that the ad does have the approval of Ms. Arthur's children, and it's also worth noting that the actress left some money to PETA in her will to continue its mission. McCruelty: I'm Hatin' It--Learn More. This campaign calls attention to the manner in which industrial-food operations exempt themselves from current U.S. Department of Agriculture guidelines. One of the best ways to avoid this kind of thing is to buy foods sourced locally, the same way suggested in the groundbreaking movie "Fresh", and also along the lines of the type of movement being promoted in Jamie Oliver's Food Revolution. When you can visit the source for your food, there's much less chance this kind of behavior can occur, and you can actually talk to the farmer(s). But when your food comes from an industrial operation based thousands of miles away, you have no idea what happens. Some simple steps everyone can take include growing your own garden, or if that's not feasible, visit your local farmers' markets or farm stand and buy some veggies, fruits, eggs, dairy products, meats, seafood, bread, herbs, honey and baked goods. You can visit LocalHarvest.org to find nearby markets, and you might even meet the farmers who raised and/or harvested your foods. Not only will they appreciate the business, but you'll be closer to the source of your food! As I noted, a year ago today, Bea Arthur passed away at age 86. She had been suffering from cancer, but reportedly died with family. Prior to TV, one of her best known shows on the Great White Way was as the boozy Vera Charles co-starring with her lifelong good friend Angela Lansbury in Mame. Incidentally, Arthur also played that Broadway role in a 1974 big-screen production of Mame co-starring with none other than the legendary Lucille Ball, which is available on DVD. But her acting career also included sharing the stage with such legendary actresses as Tallulah Bankhead, whom she would later go on to lampoon in her one-woman show which I was fortunate enough to have caught in New York back in 2005 after missing the original, and was glad to have seen it in person, which was one of her last stage performances that I am aware of, so it was awesome. To close on a slightly higher note, I think it's appropriate to feature a great clip of Bea Arthur who was featured as a guest on the last episode of the first season of the 1990's TV show "Malcolm in the Middle" (which IS available on DVD, although I haven't had any luck finding them on the NickatNight or Hulu websites). That episode is entitled "Water Park" because the family visits a water park, but has to leave Dewey at home with a babysitter. I have captured a clip featuring Bea playing babysitter Mrs. White and Dewey (played by actor Erik Per Sullivan) singing the awesome ABBA song "Fernando". I've downloaded the Flash video clip permanently, but for the moment, I found it and it also appears here (for the moment, anyway, but the embedded video below isn't going anywhere).